First things first – here are all those elusive postal details you’ve been seeking: Before the introduction of the prepaid penny post (Post Office Act of 1765) and adhesive stamps (6 May 1840), postage was usually collected from the recipient. Rather than paying in advance, one paid on delivery. In order to save their correspondents paying postage, some people had their letters “franked.” A frank was the signature of a Member of either House of Parliament, who had to write both the address on the envelope as well as his signature in his own hand. Thus postage was free. Envelopes had been developed in the 1830’s, but did not catch on until the Great Exhibition of 1851, when Jeremiah Smith displayed his gummed envelopes. 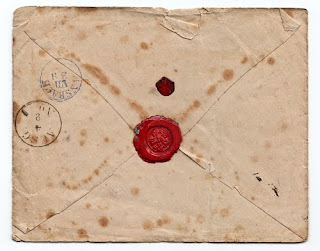 Still, the use of envelopes in correspondence was not general until well into the 1860’s, most people preferring the old fashion of folding over the sheet of paper and fastening the flaps with a wafer -a little disc of gum and flour which was moistened and pressed down with a seal. Quill pens were used long after steel nibs had been introduced. Quills soon lost their point and needed cutting with a sharp “pen knife,” so the art of cutting a nib was one of the first things taught at school. The penny post routes operated six days a week in most cases. 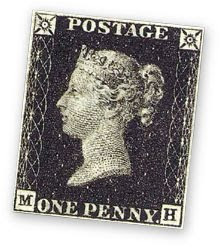 Rates of postage at a uniform penny were lower than those charged by most private carriers, some of whom charged fees as high as 4d to take letters from the nearest post town. Many private posts charged for both letters delivered and those collected for onward transmission by the general post. The official penny post charged only for letters delivered, a system which allowed for posting boxes to be provided at certain points. Letters were delivered to any house on the penny post route and in most villages receiving houses were set up where people in outlying areas could collect their mail. In 1830 the letter rates for the penny post were 4d for 15 miles, 5d for 20 miles and thence according to a sliding scale to 1s for a limit of 300 miles. A letter from London to Liverpool cost 11d; to Bristol 10d; to Aberdeen 1s 3d; to Glasgow 1s 2d. Packages weighing an ounce paid four times the ordinary rate, and for every quarter of an ounce in excess an additional sum was charged. Letters sent to addresses within the same post town were delivered free of charge. In the late 1880’s, commercially produced picture post cards became all the rage and the Post Office instituted a half penny fee for the handling of these. A late posting fee was sometimes charged and was meant to deter letters from being posted at times inconvenient to official duties, this usually being a penny. Private postal boxes were available, but not in widespread use, at the beginning of the 19th century. In 1837, the Bromley postmaster had six subscribers from whom he received a guinea each. The use of such boxes was explained in The Second Report on Postage (1838): Persons having Private Boxes enjoy generally the advantage of receiving their letters as soon as the window is open and the letter-carriers despatched, but which means, those Subscribers who reside at any distance from the post office obtain their letters so much earlier than they would do by the ordinary Delivery; they have also the opportunity of ascertaining at once whether there are any letters for them, and are usually allowed credit by the Postmaster, accounts being kept of their postage. The Postmaster could also realize extra revenue by the sale of money orders. From 1798 on, the Money Order Office was run by three partners, including Daniel Stow, Superintendent President of the Inland Office. Originally, money orders were offered in order to enable soldiers and sailors to send funds home to their families. In 1861, the Post Office Savings Bank was opened, with millions opening small savings accounts over the next forty years. The Twopenny Post served London and its suburbs. There were six collections and deliveries daily in London and three in the suburbs, letters being posted at various receiving offices during the daytime while the last collection was made by a postman who went through the streets ringing a bell. There were two kinds of postmen in London, the General who delivered the post from all parts of the country, and the Twopenny Postman, who had only to do with local mail. Both wore much the same style of uniform – a scarlet coat and shining top-hat adorned with a gold band. During the 17th and 18th centuries, postmasters had also been innkeepers due to the fact that they were responsible for finding post boys and horses, providing stabling etc. Once recognized mails came into being, this was no longer necessary and it was felt that inns provided little security for the mail bags. In October 1792 the Post Office declared itself against the appointment of innkeepers, as separate rooms for postal business were rarely provided and business might be conducted in the bar. By March 1836, only one post town in the entire country had an innkeeper as postmaster. More common were post offices run by druggists, stationers, grocers, news agents and booksellers. Women could be appointed postmistresses or allowed to take over the concern upon the death of their husbands. Of the 29 Kentish post towns in March 1836, four had postmistresses. One of these was the bustling Ramsgate office, the salary of which was roughly 178 pounds per annum. When a postmistress married, it was the ruling of the Post Office that she must give up the appointment, but it could be transferred to her husband. At Faversham, the widow of Mr. Plowman, the late postmaster, took over upon his death, but in 1800 she married Andrew Hill, who became postmaster in her place. After Mr. Hill died in July of the same year, Sara was reappointed. Part Two: Mail Coaches coming soon. Very interesting. My husband, daughter, her husband and several of my uncles worke(ed) for the post office. People may complain about the cost, but it is still a good deal. Next Next post: Writer In Residence Wanted – Hurry – Free Rent in England!